Here at Ashleigh Taylor Photography, we are really gearing up for 2011 and trying to take things to a whole new level!! I am SO committed to giving my clients THE BEST. That means the best experience, the best customer service, the best photos, and of course the best products to showcase those photos. There is NO better way to preserve and showcase your wedding photos than with a wedding album. And I’m super excited about our new albums for 2011!! These days, it seems albums get overlooked. Brides want digital files, and often that’s all that is considered. But it shouldn’t be. Because if your house was burning down, I doubt the first think you’d think to grab would be a disc. You’d probably first think to grab your photo albums. Furthermore, flipping through images on a computer is not an ideal way to share images with family, friends and your future kids and grandkids. It’s just not a warm, cozy environment and it doesn’t have that same gratification you get when you hold a photo and gaze at it. One of my favorite memories as a kid was taking out my parents’ wedding album and flipping through it with my mom. I sat in her lap and we looked long at each photo. I was filled with wonder! My mom looked like such a beautiful princess and my dad looked handsome! I saw my grandparents and aunts and uncles all looking so young and happy. Everyone looked amazing. I liked seeing the flowers, and the cake, and my mom and dad’s first kiss. It didn’t seem like their love story. In my mind, it was my story. Because in my little kid mind, it was that magical day, and my parent’s love, that made me possible. Now looking at my parents’ wedding album has a whole new set of emotions. So many beloved family members in it are no longer alive. And its so nice to hold onto their pictures through this album. It was a day where they looked their best and were so happy. And that is exactly how I want to remember my family that has passed– particularly my grandparents who passed this year. Do not underestimate the power of a wedding album. It is an heirloom. It is your family history. And it will not just be a treasure to you, but one day it will be treasured by your kids, and grandkids, and even great grandkids. It will last the test of time and be handed down through generations. I just can’t envision anyone handing down a disc with such love. And since, the importance of an album is so great, and since these albums must last the test of time, I have chosen to have all my weddings albums made exclusively by Leather Craftsmen. Leather Craftsmen has been around forever and there is a reason for it. They offer gorgeous, quality products and have amazing customer service. I am always searching for the BEST products to offer my brides, and Leather Craftsmen really is the BEST when it comes to albums. The albums are delivered in a beautiful box! The box is sturdy and a great way to store and protect your album when you don’t want to show it off! …And I love that my logo is imprinted on the side of the box!! Every album we design is unique! There are so many ways you can customize your cover. Each album comes standard with one cover photo and one line of imprinting on either the front, back or spine!! You can also choose between a leather or book cloth cover! Both are STUNNING! Below is a book cloth cover and we’ve added a stripe for a bit more pop! I LOVE the texture of the cloth– and that it is vegan friendly! Here is another view of this STUNNING book! It’s 12×12 which is quite an impressive size. It truly makes a statement! For this album, we imprinted the bride and groom’s name on the back of the back! It keeps the design clean, chic and a bit unexpected which I LOVE! I LOVE the full page spreads!! Look at how stunning that is! These books are modern and timeless. They are flushmount which means the pictures are printed right on the pages…and the pages lay flat! The pages are Leather Craftsmen’s standard thick black pages! They are guaranteed for life and won’t warp or bend! The albums are all SO well crafted and made with care. These albums are meant to last for a lifetime and then some…this is definitely something to pass down to your grandkids and even your GREAT grandkids. Truly an heirloom! I also love the luxurious leather covers as you see for Rachel & Mark’s album. This cover is in Mahogany and it’s so rich and gorgeous! 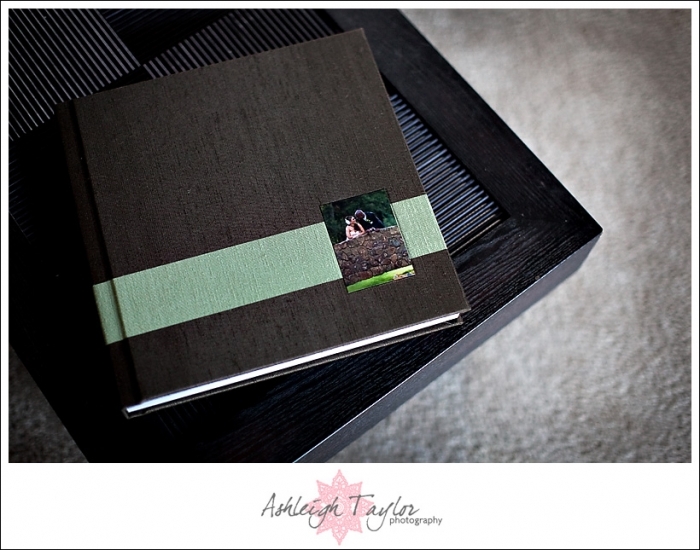 For this 10×10 album, we had the couple’s name imprinted on the spine! It’s super classy looking!! This book could not be more clean, classic and timeless! We keep the designs so simple, with just a few photos per page and clean white backgrounds. This way your book will always feel timeless and the focus in always on your pictures! So beautiful!! ellie - awesome job girlie, do you design these urself? 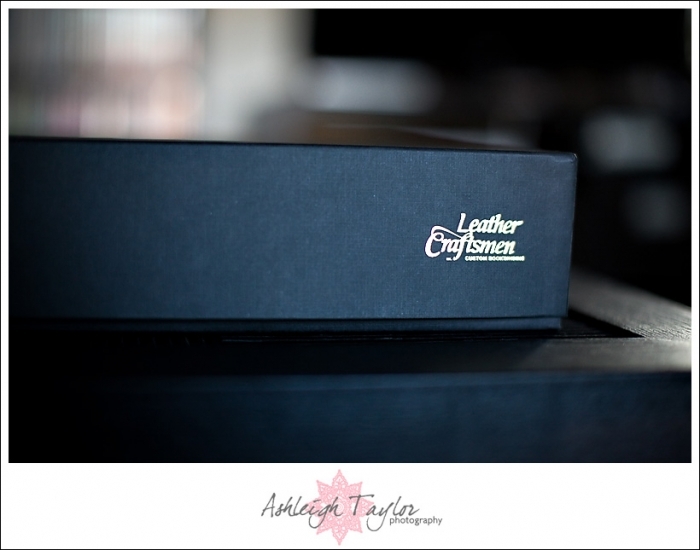 ashleigh - @ellie – leather craftsmen does design services as well and they handled everything for me! love them! David Willis - Very impressive. Wonderful imagery. Thanks for the LC mention. Tira J - What a wonderful post Ashleigh! So glad you are using LC. They are the BEST! I just adore them too. Lovin’ that mahogany album. Faye - Thanks Ashleigh! Your post convinced me to use LC for my albums. I haven’t sold any just yet, but I have a boudoir shoot lined up and the client wants an album for her husband. 😉 I showed her your mahogany album and she LOVED the look of it.